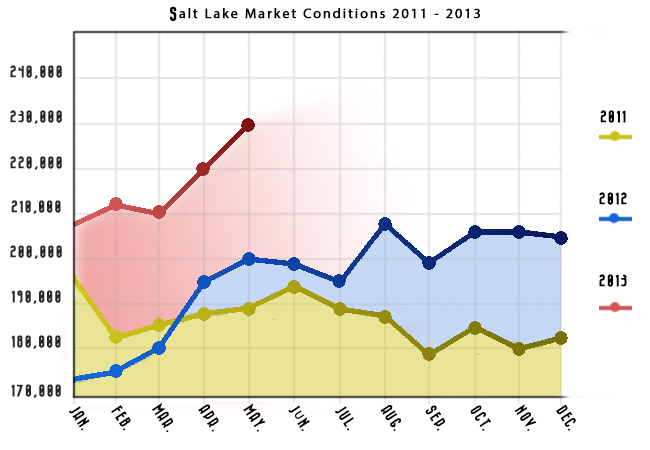 Now that we are a few months into 2013 it is a good time to start taking a look back to see what the housing market in Salt Lake County has been up to over the past couple of years. The housing market is wide reaching and has an effect on the rest of the economy. Each home that is constructed actually creates three jobs and well as collateral jobs of suppliers to the industry. Also if people are willing to make this large of a purchase it is a good indicator of consumer health. So let’s take a closer look at what has been happening in Salt Lake County. While 2012 wasn’t a great year for the housing market there were signs of recovery and so far in 2013 there are even stronger signs we are on the road to recovery. Let’s take a look at the facts. In April 2011 the median value of homes sold in Salt Lake county was $187,000. A year later in 2012 that number rose to $195,000. This past April the median value of homes sold made a large jump to $220,142. Needless to say that is a step in the right direction. Check out this graph to get a detailed look at where we have been and where we might likely be headed. The Salt Lake Housing market has been a wild ride of ups and downs over the last 8 years, but it looks like that may be coming to an end and the market will smooth out. There is a strong foundation set for a full recovery in Salt Lake County due to 30 straight months of job growth and increased buyer confidence. It isn’t going to happen over night but home prices are expected to return to value within the next couple years. What does that mean for you? Now is the time to think about buying your own home if you are planning on staying in the Salt Lake Valley for and extended period of time. To see what is available in Salt Lake County or to start your home search today visit UtahHomesForSale.com.